Remember the good old days when Americans knew who their enemies were? One of the classes I teach is American history since 1945. You would not believe how many of my students have no idea what the Soviet Union was. Sergei Eisenstein sometimes wished he was so oblivious! 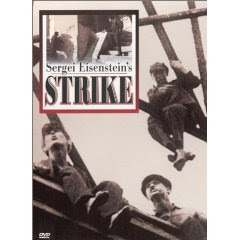 Strike (Stachka for the Russkies out there) is a Soviet propaganda piece directed by Eisenstein in 1924, seven years after the dramatic events of the Russian Revolution. The film takes place in the terrible days of Czarist rule, where most people were peasants or exploited factory workers. This particular Eisenstein piece focuses on the exploited factory workers. Unhappy with working conditions and enraged by the suicide of a co-worker falsely accused of theft, the workers go on strike. As the strike wears on wives begin to complain that there isn’t enough to eat and the men show unrest through drinking and lazing. In the end, those most hated Cossacks are called in to end the strike. This of course means the unmitigated slaughter of the striking workers (or anyone else in their path). The film is pure propaganda. Capitalists and the Czarist army are seen as instruments of evil, while the proletariats are heroic. As a history teacher, I know just how bad Soviet communism was for a number of people, so it is difficult to like the narrative of the film. However, Eisenstein was still a gifted director and does create some interesting montage shots in the film. The slaughter of the workers is interplayed with the slaughter of other “innocent” beasts—animals at the slaughterhouse. He also does a nice comparison element when he shows the grandiosity of the factory owners and the abject poverty of the workers. So, visually the film has merit. In addition, the film can be used as an educational tool to show how political propaganda helps develop the culture of its society. Not my favorite film, but still visually stimulating. Ah, all these early Soviet films.. So easy for them to become a chore! TIP, seperate them over a period. I did Strike after several others and ended up bored, which is a shame. I must re-visit sometime. It is so easy to get bogged down by the cliche of political film- the stereotypes, the propagander, that you fail to put them in context. I agree about the difficulty of watching old Stalin Era films (especially if you do one after the other). Some are interesting to watch, but I think you have to be somewhat familiar with Soviet history to appreciate most of them.